He is the yellow dragon and has a really strong body. He joins the group immediately after the Awa arc. Later on it's revealed that he was watching Yona ever since she was chased out of Hiryuu castle to see if she was fit to use the power of the four dragons. After the events in Awa he decided that he wanted to follow her, so he showed up at the campfire. In chapter 100, it is revealed that he is immortal, and that he is the original dragon warrior who received the blood of the Yellow Dragon in the era of king Hiryuu (and thus is more than 2000 years old). His power worked by having certain areas of his body being seriously injured before having that part regenerating back quickly. This was why he appeared to be a normal human when Hak tried to test whether his body was indestructible (he was not seriously injured). While his body is regenerating, scales appear on the places where his wounds were, making his body as hard as steel. 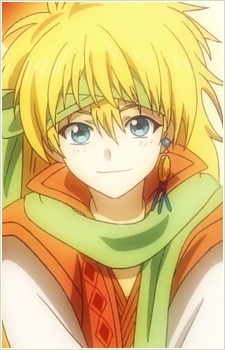 According to Zeno himself, during regeneration his physical power is no less than Kija's dragon arm or Jae-Ha's dragon leg. His personality is very childish, but he sometimes displays a strange insight and wisdom only someone older could possess. He was married in the past to a sickly girl named Kaya.